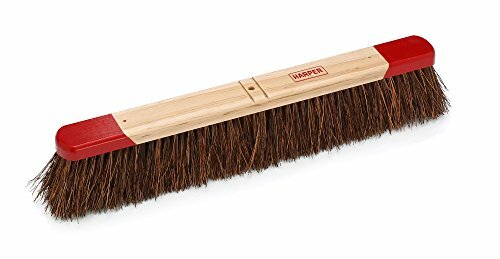 This is an outdoor rough surface broom head with 3-7/8” natural Palmyra bristles ideal for sweeping heavy debris such as gravel, glass, light snow and shingle scraps. The bristles are set into a USA Maple hardwood block with the trademarked red painted ends that are rounded to help reduce wall damage. Palmyra is a natural fiber obtained from the leaf stalks of the Palmyra palm in India. This heavy duty broom head is great for outdoor use under wet or dry conditions such as streets, parking lots, machine shops and driveways. This broom head can be used with Harpers broom handle with steel connector (part #85H) and steel brace (part #87-1), both sold separately. Harper Brush has been making brushes and brooms in America since 1900. Based in Fairfield, Iowa, Harper Brush maintains a large manufacturing operation, including; woodwork, painting and assembly in the heart of America. Harper Brush uses quality components to build products that stand the test of time. Every product that Harper Brush creates is purpose-built to tackle everything from light dust to gravel, to liquids and sludge. People who want a long lasting product and know quality, know they can trust a Harper Broom. Known for their trademark painted ends on their brooms, Harper Brush products are easily identified by people who know quality craftsmanship. Now a part of Cequent Consumer Products Inc., Harper Brush has the heritage and quality to provide brooms and brushes for heavy duty users across the globe – for durability YOU can rely on, chose the painted ends. If you have any questions about this product by Harper Brush, contact us by completing and submitting the form below. If you are looking for a specif part number, please include it with your message.